Alluna Ritchey-Chrétien telescopes are professional telescopes and convince with outstanding properties. Ideally suited for astrophotography, even with large CCD cameras, as well as for use in the broad field of astronomical research. The universal usability, stability and compact design with low weight still make Alluna Ritchey-Chrétien telescopes the perfect telescope for schools and public observatories. 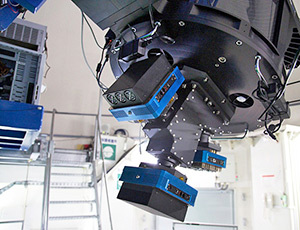 Highly accurate optics in a high quality tube, optimized system accessories and intelligent control make Alluna Ritchey-Chrétien telescopes to the reference in this size-class of telescopes. Already today our clients countless installations reliably fulfil their purpose night for night. Our Ritchey Chrétien telescopes are available in sizes 16", 18", 20", 22" and 24 inches. 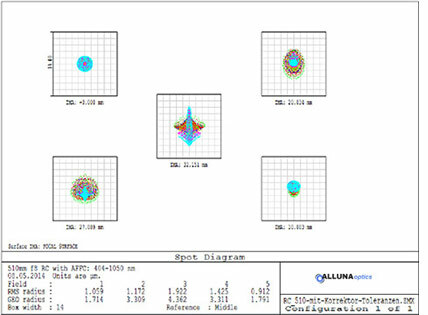 Alluna Optics has been known for years for excellent optics for reflecting telescopes. In our own manufacturing facility every single RC mirror set is manufactured with utmost precision and care as well as quality inspection. We use only optics from our own production. Only in this way have we been able to ensure a consistently high optical and mechanical quality of our telescopes for years. With delivery, each telescope comes with a detailed test certificate including all necessary optical information. When properly installed, the Ritchey-Chrétien system is known for its large, coma-free field. Astrophotographers can use our telescopes for making photographs without visible loss of a large field and without corrective lenses. For CCD cameras in full size or greater, we offer a double-lens 4 inch AFFC (Alluna Flat Field Corrector). With this corrector a photographic plane, a free field can be used of 65 mm diameter free of coma and astigmatism. The corrector is optimized from 404 - 1050 nm. 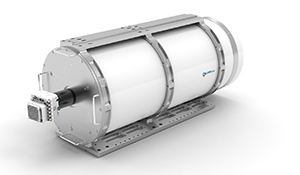 A Cassegrain telescope requires not only perfect functionality but also the greatest precision in all mechanical components for proper operation. Our telescopes meet all the requirements of high-quality telescopes this size and are regarded as a world reference point. You will not find mirror shifting under load variations, collimation problems, wobbly components or protruding screws in our telescopes. Heavy CCD cameras, for example, do not cause a problem. If required, we can build your OTA so that a 50 kg instrument load at the output is possible for very heavy accessories like spectrometers or heavy cameras. The optical performance, precision, reliability, and the demand for the highest quality are not left to chance in Alluna Ritchey-Chrétien telescopes. 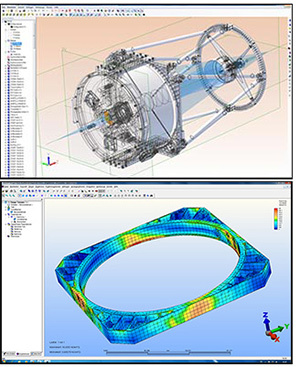 We use specifically for construction and design of our systems, the indispensable support of state-of-the-art 3D CAD. Complex parts and assemblies are modelled exactly as required and assembled virtually in advance. Thus, all parts can be optimized in advance, for example, for weight, stability and expansion behaviour. Using the most modern CNC machines for manufacturing, all parts are made from solid aluminium material in an elaborate honeycomb structure. Only in this way can an RC telescope function demonstrating optimal stiffness, resilience and collimation stability in conjunction with low weight. Image on the left. Three CCD cameras with massive distribution block, total weight 45 kg connected to an Alluna RC20 telescope output. Image on the left. Alluna RC with carbon fibre tube. Take care of your astro-images or research, the Alluna Telescope-Control-System (TCS) will take care of the basic functions on the main telescope. Firstly, the cooling of the optical tube and the primary mirror and secondly, focusing of the secondary mirror. The optional robotic main mirror cover, the instruments rotator, as well as the secondary mirror heater can be operated via the controller. In Climate mode, you get accurate temperature information, control of the fan is fully automatic depending on the current delta between ambient and main mirror temperature. In Focus mode, the current focal position is shown on a large display in digits, and the current back focus is specified from the back plate in millimeters. The focusing accuracy is at a resolution of 2240 digits per 1 mm, which corresponds to 0.446 µm/digit on the secondary mirror or 0.0035 mm on the CCD chip. With the GoTo function, you can automatically navigate to stored focal positions quickly and accurately. 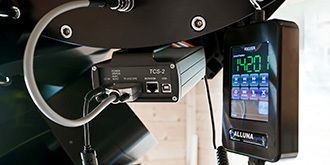 The Alluna Telescope Control System has an additional CCD Instrument Rotator mode. The precision instrument rotator has a positioning accuracy of 0.01 degrees, rotational speed 5 degrees / second. This includes all the features that are important for a comfortable and precise control of this extremely useful and necessary astrophotographer’s tool. The method of control is your choice! The TCS can be used with a PC/Notebook, autonomously with the optional touch screen hand controller or remotely. With API "Application Programming Interface" an extensive syntax is available, with which you can easily integrate all TCS functions in your own application. The ASCOM compatibility ensures trouble-free interaction with all major astronomy programs.